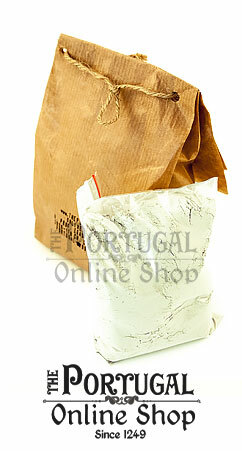 We present you "The Portugal Online Shop" French Green Clay, a unique combination of the purest and greenish Montmorillonite and Illite mineral clays available in the world! Our Green Clay is absorbent, purifying and regenerating, and it is especially indicated for the special caring of oily skins. It absorbs and regulates excess sebum, eliminates impurities, revitalises the skin and encourages cellular renewal. 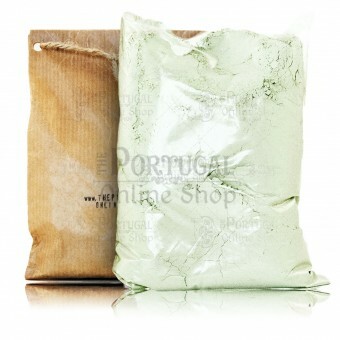 With its high content of micro-nutrients, it provides the skin with minerals and oligo-elements. Use it both externally in maks, and internally with water for detox drinks. It absorbs all skin toxic substances such as oils and other impurities. It revitalizes damaged skin cells, stimulating the appearance of fresh blood, toning the complexion and tightening pores. It's an invaluable help to keep your skin clear, fresh and young. Use it daily on trouble spots, or weekly as part of a complete facial mask. One facial mask takes approximately () for it's making. Each pack will last for around 30 facial masks. - As a poultice: Place the clay paste on a piece of natural fibre and, using a non-metallic spatula, spread it out to a thickness of . Lay the poultice with the clay directly in contact with the skin and hold it in place with a bandage, but not too tightly. If the poultice needs to be applied to an irritated area, lay some fine gauze between the clay and skin. When it comes to taking it off, remove as much of the clay as possible, wetting it if necessary, then rinse off with tepid water and dry with a cotton towel. Detox clay water : Put one or two coffee spoons of green clay in a glass cup and add mineral water. Mix with a wooden spoon or spatula. Wait until the clay deposits in the bottom and drink only the clay water left. - In the bath to soften the epidermis pour two tablespoons of crushed clay into a large glass of spring water. Stir, using a non-metallic spatula, then add the mixture obtained to the bathwater. Clay preparations should be made in glass or ceramic containers. When stirring, use wooden or glass.